Heading to the University of Georgia soon to see the Bulldogs? Here are a couple of restaurants to hit while you're in Athens. Heading to Athens, Georgia soon? Trying to figure out the best places to eat near the University of Georgia? Whether you're looking for some great jerk chicken or a much-needed chicken and waffle sandwich at 1 AM, we've got you covered right here with a list of the tastiest destinations to hit while you're in town. This review of Kelly's Jamaican Foods originally appeared April 25, 2016. Occasionally, when I revisit a place I’ve enjoyed in the past, I’ll scroll through a few recent reviews. Maybe the place changed management and went downhill. Maybe the place has a new, secret, off-the-menu treat for loyal fans. This is valuable information, but these aren’t the only reasons I read reviews. Sometimes I just want to read the reasons why a person would pan a place my taste buds know to be good. On my last visit to Athens, I had a few minutes to kill. So I clicked on the most recent Yelp reviews for Kelly’s Jamaican Foods. Kelly’s makes some of my favorite jerk chicken, but the authentic Jamaican touches—the scotchbonnet pepper-enthused jerk sauce, for example—get combined with traditional Southern dishes. On a warming table full of sides, rice and peas sit next to macaroni and cheese. Combos featuring jerk pork or curried goat are served with huge hunks of corn bread and a cup into which diners may draw ice tea so sweet it could be spread on pancakes. These items are served by two ladies who would rather be watching Deal Or No Deal than dealing with whiny college students questions about whether the jerk sauce is too hot. (If you have to ask, the answer is yes.) These factors make Kelly’s a positively delightful hole in the wall. Apparently, a Yelper named Brittany from Alpharetta, Ga., was not charmed by any of this. Brittany could not understand why Kelly’s first 96 reviews had garnered an average of four-and-half stars. She listed five issues. After refreshing my Kelly’s memory with a jerk chicken/jerk pork combo with rice and peas and macaroni and cheese, I will now respond to each complaint. Brittany’s first grievance: The setting is kind of run down and it looks really dirty. They also received an 85 on their restaurant score as of 1/16/16.. I don't need to guess where the 15 points went. Some of us feel places should pay more attention to the food than the ambience. If Kelly’s had cleaner floors or walls that didn’t sag, valuable time might have been taken away from the preparation of jerk chicken. Presumably, Brittany wasn’t blindfolded en route to restaurant. The state of the building is quite obvious from the outside. If that is objectionable, why walk in and eat? Some of us prefer our holes in the wall have actual holes in the wall. The Subway next door probably scored a 100 with the health department. Kelly’s probably had 15 subtracted for being too damn delicious. Brittany’s second grievance: The woman who is supposed to greet customers has the worst attitude. She doesn't say hello or smile when you come in, she just stares at you; she's standoffish and cold. Brittany clearly never considered that her demands on this woman’s time might be keeping the lady from a date with Howie Mandel and models holding briefcases. She gave you jerk chicken that can fill the belly and clear the sinuses. Don’t expect small talk. Brittany’s third grievance: I ordered the small jerk chicken plate with mac and cheese and rice and peas. For over $9, the portion size was filling. However, the food was just dumped onto the plate. It was so messy and haphazard. At least try to plate the food properly instead of splattering it everywhere. So sorry, your majesty. For the considerable sum of nine American dollars, one should expect the food to be piled into a cheeky culinary mountain in the middle of a piece of bone china, drizzled with balsamic vinegar and topped with a mint sprig. Or, since it’s about to get dumped down your gullet and into your stomach—where it shall be dissolved by acid and broken down into its constituent parts—perhaps it’s more efficient to simply place the tasty food on the plate in the quickest manner possible. Brittany’s fourth grievance: When it comes to flavor, the jerk chicken itself was actually really good. The meat had a lot of flavor and spices and it fell off the bone. Now to the sides... they were just awful which was really surprising. The mac and cheese was soooo bland. It was crazy... if you've ever made even Easy Mac, you know that cheese can add a lot of flavor so I'm not sure why the mac and "cheese" tasted like there was NO cheese in it. The mac and cheese also had red stuff on it. When I asked what is the red stuff, the answer I got was "cheese." Well, I have never seen red cheese so I still have no clue what that is. Perhaps because of Brittany’s intrusion into her game show time, our hero didn’t feel Brittany deserved to know about paprika. After the horribly inaccurate description of the flavor of perfectly fine mac and cheese, I’m glad that secret wasn’t divulged. Brittany’s fifth grievance: The rice and peas was soo bland as well! Just absolutely zero flavor and very dry. The meal came with cornbread which tasted nice, but had a thick cake like density instead of the normal soft, crumbly yet melt in your mouth cornbread texture. People from different countries cook cornbread differently than grandma did? Wait until Brittany finds out that some of them say words differently, too. And you’re supposed to have them put a little jerk sauce on the rice and peas. Don’t ask so many questions about the cheese and they might do that for you. This review of The World Famous originally appeared Sept. 15, 2014. Feel free to re-read that quote. It’s a good one, but I don’t expect you gave it your full attention. I imagine your brain stopped working at “Chicken and Waffle Club Sandwich.” Yes, that is essentially what you think it is. It’s a boneless fried chicken breast with a drizzle of hot sauce accompanied by lettuce and bacon and served between two quarters of a Belgian waffle dabbed with bourbon maple butter. It’s divine, and Patrick was entirely accurate about the grenade part. After I finished, I needed to be scraped off the floor. Did I mention The World Famous serves that incredible edible edifice until 2 a.m. six nights a week and until midnight on Sunday? 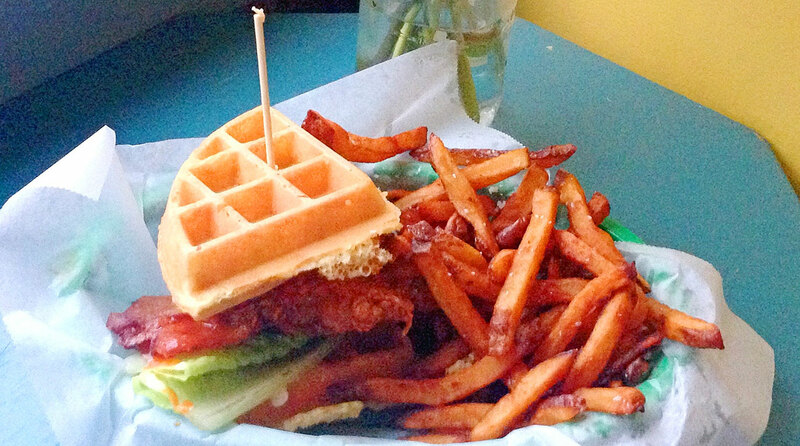 The World Famous serves this chicken and waffle club sandwich until 2 a.m. six nights a week. Yes, the nation’s quintessential college town has a bar that serves white-tablecloth quality grub alongside hey-what-would-happen-if-we-tried-this cocktails from lunch until last call. On my visit last week, I also had fried pickled okra. Fried okra is a classic Southern side dish. Pickled okra is a classic Southern snack. Fry pickled okra, and you have beer’s best friend. Or maybe you want the steamed pork buns. Patrick called these “little pillows of heaven,” and his descriptions remained spot-on. Later, when I inquired about the poutine – which I had not ordered – Patrick decided I had to try at least a fraction of an order. When I dine for these reviews, I don’t tell anyone where I work or that I’m writing about these places. Patrick was just trying to make sure a first-time visitor sampled a popular seller from the menu. This is great business. It helps that he presented a bowl of hand-cut fries smothered in beef gravy and mixed with cheese curds. That’s what poutine is, and other than John Candy, it is Canada’s finest contribution to the world. It tasted as you might imagine hand-cut fries with beef gravy and cheese curds would taste—as if I’d died and gone to the most delicious part of Quebec City. At this point, I feel it’s necessary to reiterate that THIS PLACE SELLS CHICKEN, BACON AND WAFFLE SANDWICHES AND GRAVY CHEESE FRIES AT 1 O’CLOCK IN THE MORNING, GOD BLESS AMERICA. Before I left, I had to sample the signature cocktail. This is the Tango Whiskey Foxtrot. It mixes whiskey from the well—you won’t need to bother with a call brand—lemon, maraschino liqueur and ginger ale in a glass rimmed with Tang. That’s right, the powder form of the drink the astronauts took to the moon. A couple of those might put a diner on the moon, but fortunately, the world’s most decadent club sandwich and the poutine will provide all the gravity he needs to return to earth.